Heat oil in large nonstick skillet over medium-high heat and brown chops on one side, about 3-4 minutes. Turn, add salsa to skillet; bring to a boil, lower heat, cover and simmer for 8-10 minutes. This is the quickest skillet supper in the West. 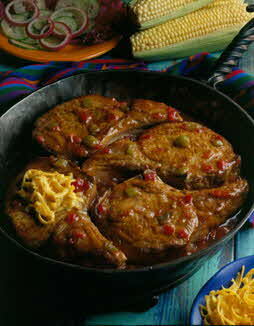 Brown pork chops; simmer briefly with your favorite salsa. Top with grated Cheddar cheese and chopped fresh cilantro, and serve with corn on the cob and a tossed green salad.